Today was the day. After three wonderful days in Eindhoven visiting Carol’s children, Stacey, Carol and I were ready for our adventure to begin. We woke about 9am. After showering, we had breakfast, piled into the car, and headed for the center of town: I, to look for shoes (since my dependable Merrill’s were killing me) and Carol, to look for a portable seat. No shoes for me, but success for Carol. We had thought of getting to the airport really early, to meet the rest of the group who were arriving at the airport from New York at 3pm. But we decided that taking care of this shopping was important. It was a day of on and off rainstorms. Carol’s daughter had called the City Chopper (KLM) that would fly us to Amsterdam several times to see if there were any delays. Twice she was told “No.” So we leisurely packed and headed for the City Chopper airport. Upon entering the small airport, we saw a posting that our flight to Amsterdam was delayed from 5:30 to 7:15… so much for the reassurances given over the phone. We began to regret not having stuck to our original plan to meet the other WCAers at 3pm. As the 7:15 flight was out of the question, the ticket agent gave us free first-class tickets for the train to the airport, checked in our luggage and gave us boarding passes for our Tel Aviv flight. All we had to do when we got to the airport, we were assured, was to drop off our luggage and board. Hurriedly, we were driven to the train station, and we boarded the train a few minutes behind schedule. The trip took 1½ hours, getting us into the airport at 6:50. We rushed to the “Drop-Off Luggage Here” area, only to find out that we were too late to check luggage or get onto the flight. The security check would take t-o-o-o-o long. Stacey and I were TRULY UPSET, REALLY UPSET, TRULY UPSET!!! Carol, though disappointed, remained calm and unruffled. After speaking to supervisors and the like, the KLM answer was still “NO GO.” We were directed to KLM ticketing. An unflustered Carol negotiated with the ticket agent. First option was the same flight tomorrow: no good, as we would totally miss the training sessions. Next option, to Bucharest, but that flight was totally booked. Finally, a flight via Vienna early the following morning. Tickets were printed, boarding passes given and we headed downstairs to get our hotel vouchers. “Weather delays do not entitle you to a free room,” we were told by a kindly ticket agent. But either because we looked pretty or pooped or pissed, he gave us the vouchers to two rooms in a brand new Sofitel. We boarded the appropriate bus, still very upset. However, as soon as we entered the beautiful lobby of the Sofitel, we relinquished our fury. We checked in, got into our rooms, and “oohed” and “aahed.” Luxurious and cleverly designed, every bit of anger and disappointment was soothed out of our weary bodies. Our first task was to go down to the free buffet dinner for all of “The Stranded.” It was 9:15 and we were informed that dinner ended at 10. We were entitled to a delicious tomato soup, appetizers of a variety of scrumptious fish and one glass of wine. We were happy to pay for two more glasses of wine each. Full and fatigued, we retired to our rooms to call our husbands and the children and get them up to date. We called the Knights Palace Hotel to leave a message for the women that we were detained. We used Stacey’s Net-to-Phone account for all of our calls. Carol went next door and Stacey and I went to sleep after going on and on about the gorgeous place we were in – some good out of a little bad luck. 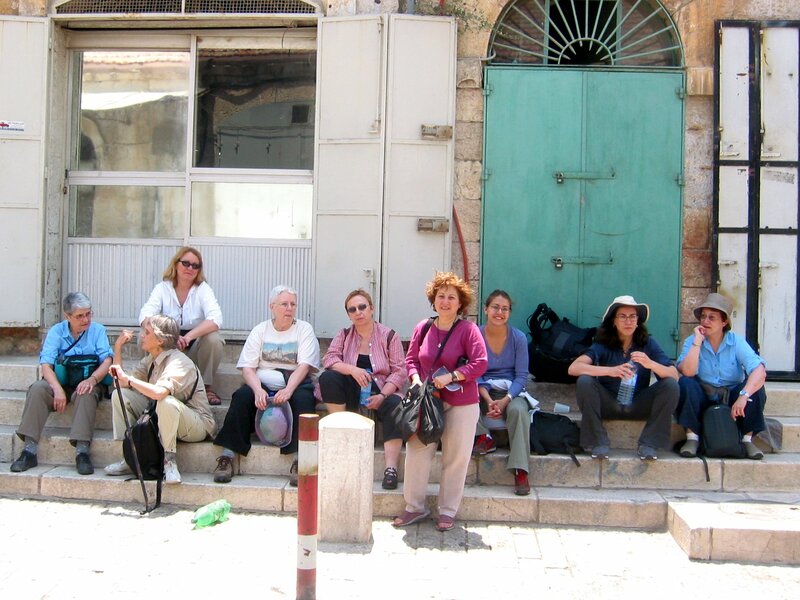 After a late night arrival, ten of us were in Jerusalem waiting for a servisse to Ramallah. Three other WCAer’s were in transit from Amsterdam, and one was being held, resisting deportation. It is easier to fly, as Ahmad is home safe; I feel that if something happened, he will be with the boys, so I am unusually relaxed about the travel. Flight to Amsterdam is uneventful, and Jenny and I study our Arabic. We had a 5 hour layover, so we went into Amsterdam Central for lunch. Doreen, Stacey, and Carol flew to Amsterdam earlier, to visit Carol’s daughter. Arrived at Ben Gurion Airport at about 1:30 AM. It was very busy; there were numerous “checkpoints” inside the airport. I felt extremely anxious after having had NY training by Jack and Elena and Lysander re: BG interrogations. But we got past customs, just ahead of Gail. Eileen and Susan, who had come as a group with Gail, waited near an ATM machine. We waited there for about 1/2 hour, finally realizing that Gail had been intercepted by security, and decided to get out of the airport as quickly as possible. It was a maze of aisles, and somewhere near the exit, Eileen and Susan vanished. Jenny and I rushed outside where Judy and Joya were standing, near the shared vans. At about 3: 30, we decided to go to East Jerusalem and wait for Gail–to the Knights Palace – at least there was a telephone there. It took about 1/2 hour – 40 minutes, but it was a poignant introduction to Jerusalem. As we walked through silent ancient streets, many seemed an arm span’s width – stone buildings, stone walls, stone cobbles, stone stones, it felt dreamlike, except for the Israeli driver and some Orthodox passengers going to West Jerusalem.